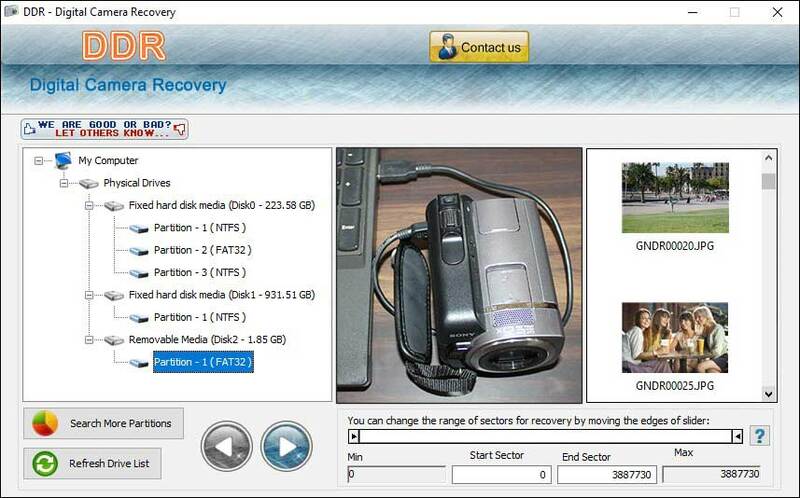 Digital Camera data recovery tool is an easy and non-destructive software which fully restores lost, deleted and formatted digital photos, images, audios, videos having any file format including JPG, JPEG, TIF, GIF, RiFF, TIFF, AVI, PNG, BMP, MPEG, MOV, WAV, MIDI, QuickTime or any other supported file stored in your digital media. Tool easily rescues files and folders which were lost due to pulling of memory card while the camera was still in running mode. Application reveals data even if DRIVE NOT FORMATTED message is displayed on your computer screen. Image Restorer has an easy to use graphic user interface which makes it easier for user of any background to operate it. Retriever saves recovered images, audio and video files at user specified location. Undelete utility is so simple that no specific knowledge is required by the user. Digital camera data undelete tool retrieves lost files from all types of digital cameras including Digital Video Camera, Professional Camera, Novelty Camera and Specialty Camera. Software supports all manufacturers made digital camera including Olympus, Kodak, Canon, Nikon, Konica, HP, Philips, Toshiba, SanDisk, Fuji-Film, Casio, Sony, Samsung, Panasonic, Epson, IBM, Minolta, Sanyo, LG, Sharp, Mitsubishi, Kyocera, Ricoh, Hitachi, Pentax, Verbatim, Yashica and more. Program scans every sector on the disk to ensure that all recoverable pictures are retrieved in the easiest way. *Tool supports all major brands of camera including Nikon, Sony, Fujifilm, Kodak, Samsung, Toshiba, Canon, Panasonic etc. *Application has an easy to use interface and inbuilt user help manual for user assistance. *Digital camera data recovery tool undelete JPG, BMP, JPEG, PNG, MPEG, TIF, GIF, RiFF, TIFF, AVI, MOV, WAV, MIDI and QuickTime. * Rescuer reveals data even if DRIVE NOT FORMATTED message is displayed while accessing with computer. * Digital camera data rescue tool is read only and non destructive utility.